Our beloved country has a lot going for it, but road safety is not among its virtues. This explains why safety is the number one requirement for so many motorists when choosing a car, with fuel-efficiency and affordability a close second and third. Often safety is directly related to purchase price, but some manufacturers successfully design and build safe yet affordable cars. One such example is the Honda Amaze, which uses Honda’s ACE™ Body Structure. ACE™ stands for Advanced Compatibility Engineering™, and it’s a Honda-exclusive body design that uses a network of front frame structures to absorb and deflect the energy from a frontal collision. This helps reduce the force transferred to the cabin. To prevent collisions from happening at all, ABS brakes with electronic brake force distribution (EBD) are fitted as standard. Additionally, all versions of the Honda Amaze have dual front airbags, inertia reel seatbelts front and rear, front anti-whiplash head restraints and Isofix child seat anchors. If your youngster travels in a car seat and you’re still fastening it with a seat belt, put Isofix to the test. It’s easier and safer to use. Peace of mind also comes from knowing that all doors auto lock once the vehicle begins to move, while Bluetooth across the model range allows for hands-free telephone calls. (Still, it’s safest not to make any calls while driving.) A multifunction steering wheel allows convenient control of the audio system. 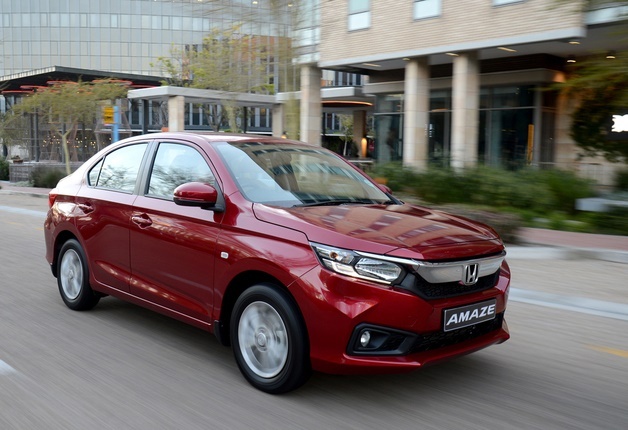 An advanced and reliable engine powers the new Honda Amaze. The 1 199 cc four-cylinder unit employs Honda’s i-VTEC intelligent valve timing management system, ensuring optimum performance and fuel efficiency. Maximum power output is 66 kW, combined with a torque peak of 110 Nm. In the baseline Amaze Trend, a five-speed manual gearbox is standard, while buyers of the Comfort model can also opt for a new-generation automatic Constantly Variable Transmission (CVT). With a kerb mass of just over 900 kg, the Amaze accelerates swiftly, yet uses very little fuel overall. The manual-transmission Amaze variants achieve a combined cycle fuel consumption figure of only 5,6 litres/100 km, while the CVT version’s 5,7 litres/100 km is virtually the same. This translates to 17-18 kilometres per litre and is entirely achievable. Considering its spacious cabin, large boot (420 litres) and long list of standard equipment, buyers might expect to find this Honda in the R250 000 to R300 000 segment. But the Amaze defines a new standard for affordable compact sedans. The generously equipped Amaze 1.2 Trend manual is priced at just R179 900, while the more luxurious 1.2 Comfort manual sells for only R193 900. If you spend lots of time in stop-start traffic, the 1.2 Comfort with automatic CVT transmission will fit you like a driving glove. In addition to highly competitive pricing and low fuel consumption, a two-year/30 000 km service plan reduces running costs even more. The range is further supported by a full five-year/200 000 km warranty and a three-year AA Roadside Assistance package. Scheduled services are at 15 000 km intervals. The Amaze’s a surprising and successful fusion of safety, affordability and low fuel consumption makes it the most compelling compact car on the local market. When you test-drive it, notice how its refined ride makes light work of inferior road surfaces. And keep in mind that legendary Honda reliability might be the most important safety feature of them all. This post and content is sponsored, written and provided by Honda. By now everybody is back at work or school and ready to kick start the year! Discovery Channel has the perfect way to get your heart’s racing and rev up your engines with - exciting Turbo content.